The bright eyes of Mooloolah boxer Sonia Williams do nothing to reveal the scars of the challenges she’s faced over the past five years. 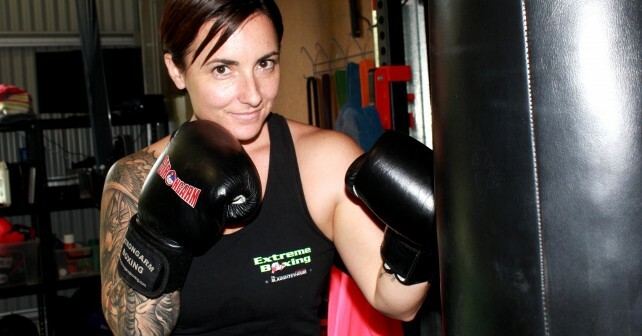 She endured sexual discrimination and physical abuse as the first female member of the New South Wales police riot squad, countless work-related injuries and 22 surgeries, a medical discharge from the police force, depression and four suicide attempts – but she is now rebuilding her life and a boxing career, and hoping to be a role model for others. The 33-year-old won all three rounds to record a dominant victory in her first amateur boxing bout in Caloundra in February, and she is now training for her first professional fight on the Gold Coast in December. “People ask me who I aspire to, who is my role model,” Mrs Williams said. Mrs Williams grew up as a self-confessed tom boy, and was a competitive body builder and first degree Tae Kwon Do black belt by age 18. She was NSW Womens Full Contact Sparring Champion from 14 to 18, and won a bronze medal in bare knuckle contact fighting at the World Martial Arts Games in 2000. At 18, she followed her life dream and joined the NSW police force, where she went on to become the first female ever to be signed to the riot squad, with some 80 male colleagues. That’s where life started bombarding her with challenges. She was advised by a colleague she was unwelcome in the male-dominated squad and that she would be “broken”. Her knee was busted badly in her first “soft” training event on her very first day. However, she persevered, before eventually leaving the riot squad in 2010, but was medically discharged from the police force, perhaps somewhat ironically, after being badly injured in a student university protest in May 2012. Her list of medical procedures is quite daunting – knee reconstructions, broken wrists, hearing loss, hip injuries, multiple muscle tears and tendon damage, herniated and bulging discs, disc replacement, nerve damage, cysts and foot injuries. After her discharge, and despite moving to Queensland with husband Glenn, she battled lingering injury and pain, lost life focus and fell into depression. She attempted suicide four times, the fourth when she smashed her car at high speed into telephone pole on Steve Irwin Way in late 2014 – she escaped with only two broken feet. It was the crash that changed her life. From there Mrs Williams started training seriously with legendary Sunshine Coast boxing trainer Bobby Stimson. She’s also being helped by Glenn, a former special services soldier-turned personal trainer. “I’d be lying if I said I didn’t have bad days, but I’ve come a long way,” she said. Her boxing career takes the next step when she heads to a training camp to Thailand in July to train with some of the toughest kickboxers and Mixed Martial Arts fighters in the world. “I’m going to be the next world champion in my weight division,” she said confidently. The powerful words of affirmation are themselves a necessary positive force for this fighter’s rebirth. From there, she knows not even the sky is the limit. Photo caption: Mooloolah boxer Sonia Williams has overcome countless challenges on her journey toward her first professional bout in December.